I’m not much of a biographical drama film guy – as I’ve mentioned before in countless reviews, and the same can be said about a lot of films centered on war. Some do really amazing, but I’m always wary because of my personal stance on things like war. However, the trailer to American Sniper was so well done, and so brief as to what the film was about that I kind of had to watch it. I loved the suspense given in the trailer and if there was one thing I wanted from the entire film – it was that suspense. Did it have suspense – yes and no…but it did have something better. 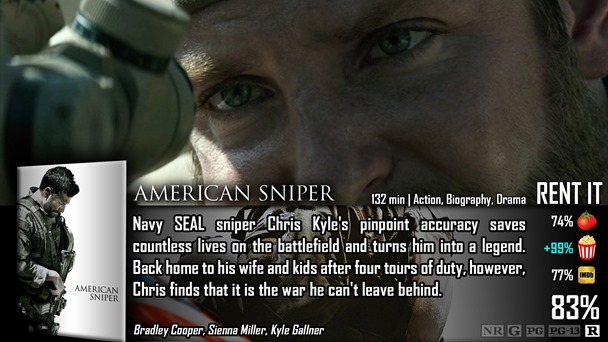 American Sniper centers on the life of Chris Kyle, a man that was considered the deadliest sniper in U.S. history – and for good reason too. As far as plot goes, that’s all I can really say other than in the movie, he struggles juggling life at home with life in the field – and how he can’t seem to leave the boundaries of war. It’s not exactly PTSD, mind you…but it’s close enough to affect his home life with his wife and kids. You mean this isn’t the spin-off to American Idol where they summon all of the past winners of the reality show, pin them against each other, and have them scour the woods until they find sniper rifles to fend themselves off with? Oh…okay, well I’ll take this instead. I’m only kidding, but you can definitely tell American is a big part of this film. The whole concept of patriotism is as loud as a grenade explosion in this film. It’s not what I consider totally realistic when it comes to the attitudes of the rest of the marines – but when it focused on Chris, I believed it, and that’s what is important. It’s important that you like this guy – and I really found it hard not to love him. Bradley Cooper is an extremely talented actor that made it look like child’s play in this role. He grew up in an all-American kind of way…I mean he wanted to be a cowpolk for crying out loud. He had the southern accent and well-mannered attitude – and a cowboy in the middle of war is…well, it’s kind of cool when you think about it. I think the success of this film hinges on how much you fall in love with his character, because in the end, that’s truly all it had going for it. 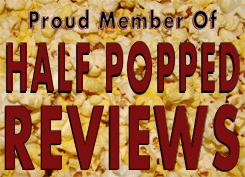 Now, here’s where I disagree with most critics – and also why I dislike biographical films. There is no traditional plot. It’s not – let’s get from A-B and kill the main bad guy…but it does have traditional elements in a way throughout the film at the same time. There IS an end-goal bad guy – and another villain that is Chris’s match that prove to be threats in a very normal kind of way. It’s also unpredictable because I don’t know anything about this guy’s life. I don’t know if he will live or die…all I know is that his nickname is the Legend during the events of the film. I prefer a traditional plot because I like more material to talk about – but I’ll say what they did here…was very well done regardless – and I can’t ignore that. There was a lot of suspense in this movie for something that was based on a true story – and that’s mostly because it took it’s time making the audience fall in love with the main character. The main character was key – and once you fall in love with his values and life…you really don’t care what you see him do – just that you see him do it. It’s still biographical, which means what you’d consider traditional plot to be missing. If you don’t mind movies for just…following people around for what feels like day to day without any real direction…than you’ll probably love this movie – because the things that happen are still really captivating. I understand your concerns regarding biographical dramas. For me, they work. All I ever require is an interesting story to get me hooked. But for sure biographies can be very boring, and tend to be frustrating to describe as far as reviews go b/c they are definitely the kind of day-in-the-life type stories that are hard to discuss without ruining for everyone. I’m really excited about this b/c it’s Brad Cooper in the lead and Clint Eastwood in the director’s chair. Great review. I really want to see this one. I have always been a fan of Clint Eastwood’s work.